Statesman, bishop under the Merovingians, born c. 580; died c. 640. 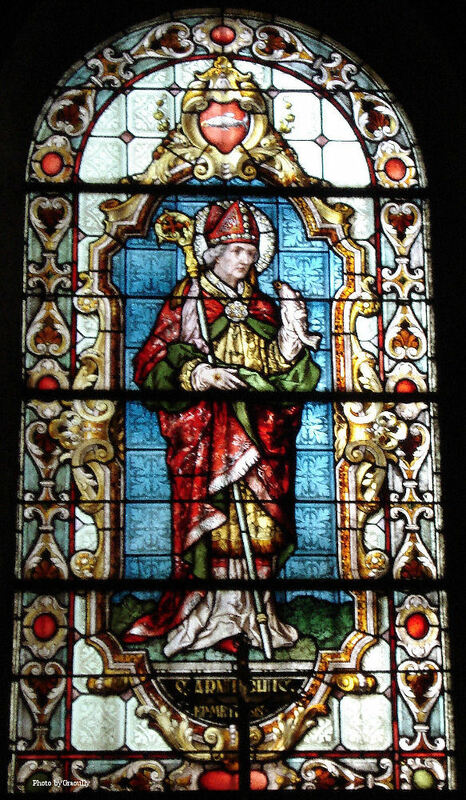 Stained glass window of St. Arnulf of Metz in the Chapel of Sainte-Glossinde. His parents belonged to a distinguished Frankish family, and lived in Austrasia, the eastern section of the kingdom founded by Clovis. In the school in which he was placed during his boyhood he excelled through his talent and his good behaviour. According to the custom of the age, he was sent in due time to the court of Theodebert II, King of Austrasia (595-612), to be initiated in the various branches of the government. Under the guidance of Gundulf, the Mayor of the Palace, he soon became so proficient that he was placed on the regular list of royal officers, and among the first of the kings ministers. 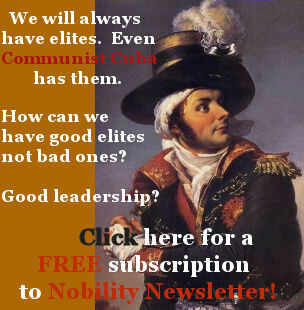 He distinguished himself both as a military commander and in the civil administration; at one time he had under his care six distinct provinces. In due course Arnulf was married to a Frankish woman of noble lineage, by whom he had two sons, Anseghisel and Clodulf. 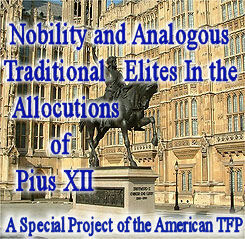 While Arnulf was enjoying worldly emoluments and honours he did not forget higher and spiritual things. His thoughts dwelled often on monasteries, and with his friend Romaricus, likewise an officer of the court, he planned to make a pilgrimage to the Abbey of Lérins, evidently for the purpose of devoting his life to God. But in the meantime the Episcopal See of Metz became vacant. Arnulf was universally designated as a worthy candidate for the office, and he was consecrated bishop of that see about 611. In his new position he set the example of a virtuous life to his subjects, and attended to matters of ecclesiastical government. In 625 he took part in a council held by the Frankish bishops at Reims. With all this Arnulf retained his station at the court of the king, and took a prominent part in the national life of his people. In 613, after the death of Theodebert, he, with Pepin of Landen and other nobles, called to Austrasia Clothaire II, King of Neustria. When, in 625, the realm of Austrasia was entrusted to the kings son Dagobert, Arnulf became not only the tutor, but also the chief minister, of the young king. At the time of the estrangement between the two kings, and 625, Arnulf with other bishops and nobles tried to effect a reconciliation. But Arnulf dreaded the responsibilities of the episcopal office and grew weary of court life. About the year 626 he obtained the appointment of a successor to the Episcopal See of Metz; he himself and his friend Romaricus withdrew to a solitary place in the mountains of the Vosges. There he lived in communion with God until his death. His remains, interred by Romaricus, were transferred about a year afterwards, by Bishop Goeric, to the basilica of the Holy Apostles in Metz. Of the two sons of Arnulf, Clodulf became his third successor in the See of Metz. Anseghisel remained in the service of the State; from his union with Begga, a daughter of Pepin of Landen, was born Pepin of Heristal, the founder of the Carlovingian dynasty. In this manner Arnulf was the ancestor of the mighty rulers of that house. The life or Arnulf exhibits to a certain extent the episcopal office and career in the Merovingian State. The bishops were much considered at court; their advice was listened to; they took part in the dispensation of justice by the courts; they had a voice in the appointment of royal officers; they were often used as the king’s ambassadors, and held high administrative positions. For the people under their care, they were the protectors of their rights, their spokesmen before the king and the link uniting royalty with its subjects. The opportunities for good were thus unlimited; and Arnulf used them to good advantage. During an outbreak of the plague a monk named Arnold, who had established a monastery in Oudenburg, persuaded peo­ple to drink beer in place of water and when they did, the plague disappeared. St. Arnold is revered as the Patron Saint of Brewers. 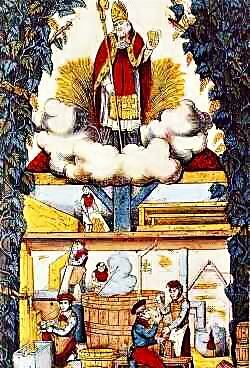 An image of St. Arnold (Arnulf) of Metz watching over the beer brewing. One of the parishioners, Duc Notto, prayed “By his powerful intercession the Blessed Arnold will bring us what we lack.” The beer mug didn't run dry until everyone's thirst was quenched. Belgium Brewing History The small country of Belgium calls itself the ‘Beer Paradise’ with over 300 different styles of beer to choose from. Belgium boasts of centuries old tradition in the art of brewing. In the early Middle Ages monasteries were numerous in that part of Europe, being the centers of culture, pilgrim­age and brewing. 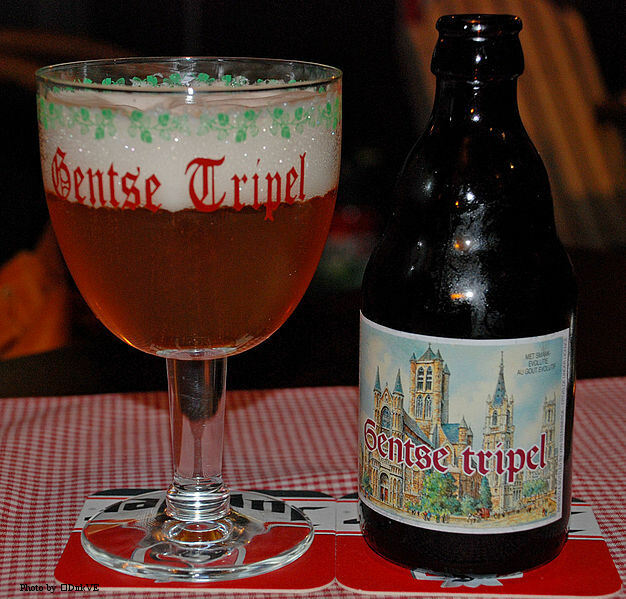 Belgium still has a lot of monasteries and five of these are Trappist, a strict offshoot of the Cis­tercian order, which still brews beer inside the monastery. During one outbreak of the plague St. Arnold, who had established a monastery in Oudenburg, convinced peo­ple to drink beer instead of the water and the plague disappeared as a result. Saint Arnold (also known as St. Arnoldus), is rec­ognized by the Catholic Church as the Patron Saint of Brewers. St. Arnold was born to a prominent Austrian family in 580 in the Chateau of Lay-Saint-Christophe in the old French diocese of Toul, north of Nancy. He married Doda with whom he had many sons, two of whom were to become famous: Clodulphe, later called Saint Cloud, and Ansegis who married Begga, daughter of Pépin de Landen. Ansegis and Begga are the great-great-grandparents of Charlemagne, and as such, St. Arnold is the oldest known ancestor of the Carolin­gian dynasty. 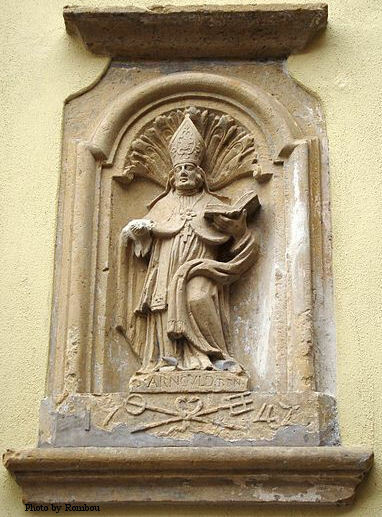 St. Arnold was acclaimed bishop of Metz, France, in 612 and spent his holy life warning people about the dangers of drinking water. Beer was safe, and “from man’s sweat and God’s love, beer came into the world,” he would say. The people revered St. Arnold. In 627, St. Arnold retired to a monastery near Remiremont, France, where he died on August 16, 640. In 641, the citizens of Metz requested that Saint Arnold’s body be exhumed and ceremoniously carried to Metz for reburial in their Church of the Holy Apostles. During this voyage a miracle happened in the town of Champignuelles. The tired porters and followers stopped for a rest and walked into a tavern for a drink of their favorite beverage. Regretfully, there was only one mug of beer to be shared, but that mug never ran dry and all of the thirsty pilgrims were satisfied. The number of breweries increased over the centuries and by the 1900’s there were around 3,000 breweries in Belgium; nearly one in every village. The successive shocks of the industrial revolution, World War I and the 1929 crash (the stock market) meant that the smallest breweries either merged or disappeared. Today there are 178 breweries in Belgium, but the most astonishing fact for observers is not the number of breweries but the in­credible variety of beers to choose from. The principal characteristic of Belgian breweries is their creativity. Though it is true that pilsner style beers account for 70% of sales, the remaining 30 % is made up of Belgium’s famous specialty beers.